In early January this year I attended a Chinese New Year baking class at Shermay's Cooking School. 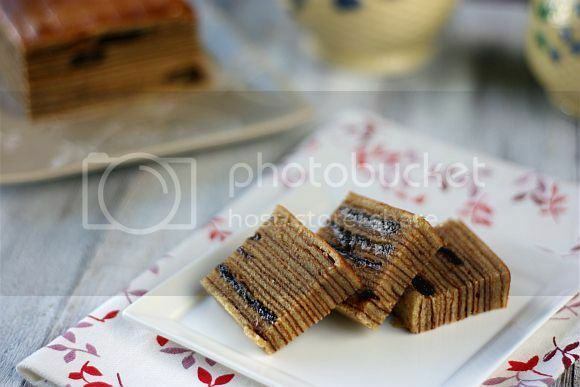 One of the goodies taught by Valerie Kong was the famous Kueh Lapis Spekkoek (Indonesian Layer Cake). I had tried making this layered cake last year but somehow it did not turn out well at all. So when this class came up, I decided to sign up for it to see how it was actually made. 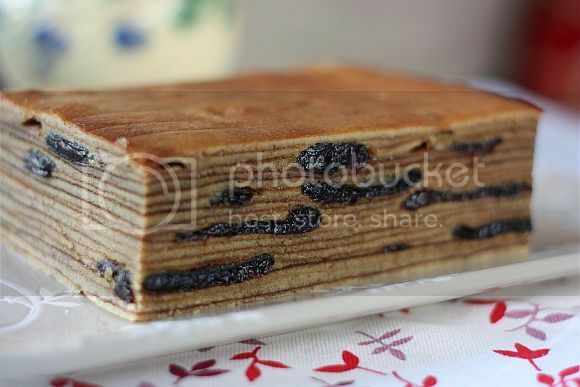 Kuih Lapis Spekkoek or more popularly called Lapis Legit in Indonesia is a Dutch-Indonesian layered cake. In Indonesian lapis legit literally means (very) rich layer-cake. And you better believe that it is rich! Look at the number of egg yolks, sugar and butter used in the recipe. 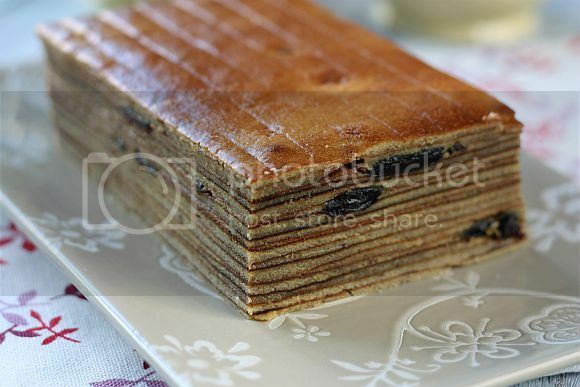 This cake is made up of very thin layers of cake that are piled on the top of each other. A good lapis legit usually has more than 18 layers. (Mine actually had about 21 layers as I used a slightly smaller baking pan.) This makes the baking of spekkoek a very labour-intensive process. Because of this this cake is rather expensive to buy. Not many people would actually make this at home because of the time required to be set aside in baking one. The recipe I have posted her does not belong to Valerie Kong as it would not be right to publish it. However I managed to find one that is quite close to hers. 1) Butter the base of an 8″ X 8″ X 2.5″ pan and line with baking parchment. 2) Pre-heat your oven, selecting the grill function. 3) Sift the plain flour and mixed spices together. 4) Beat the egg yolks and sugar together until pale yellow, thick and creamy. 5) Cream the butter and condensed milk together until soft and fluffy. Add the creamed butter to the egg yolk mixture and mix until combined. 6) Beat the egg whites until medium firm peaks. 7) Fold in the egg whites, followed by the flour mixture into the rest of the batter. 8) Stir in the vanilla essence and rum until well-combined. 9) Spread a thin layer of batter onto the parchment paper. 10) Grill for 7 - 8 mins on the lowest rack in your oven or until lightly golden brown. 11) Remove cake pan from oven and press the baked layer down lightly with a metal fondant smoother. Prick all over the layer of cake with a toothpick. 12) Repeat steps 9 to 11 for each layer. (Optional: Add prunes on every second or third layer). 13) For the last layer, turn the oven down to 180 degrees C and bake on middle rung for 15 minutes or until golden brown. 14) Remove from oven and run a paring knife along the edges of the cake pan. 15) Turn the kueh lapis out of the pan and remove the baking parchment. 16) Flip cake back upright and let cool. Oh goodness Jo, this lapis looks so good! I seriously don't mind gaining a couple kg over this delicious cake! Jo, Hats off to you! 21 layers! The layers are so need and even. Thumbs up! The lapis looks so good! The layering is so even! What an interesting dessert... 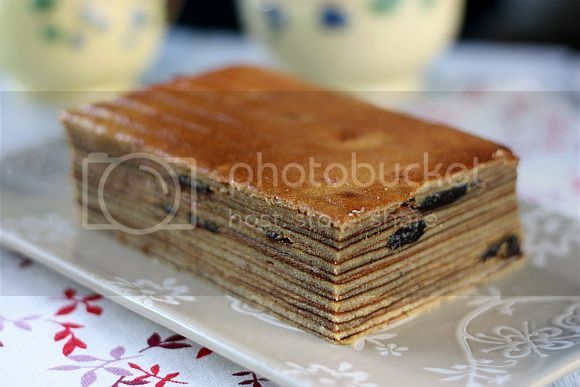 I would like to try it soon, I'm sure the thin layers make such a great texture and taste! 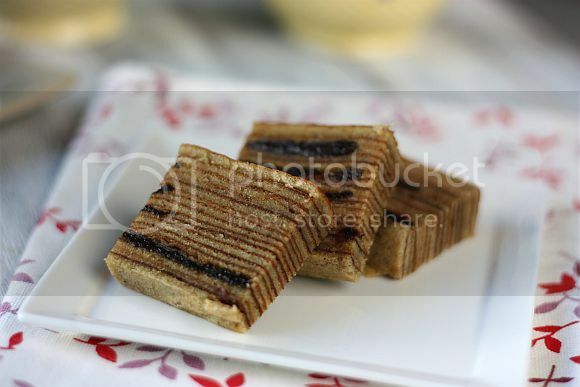 heard that kueh lapis is really difficult, but there you pull it off beautifully! I wanted to bake this layer cake long ago, but stop the idea whenever i saw the number of egg yolks added..Anyway, die die one day i must make this, hehehe..Yours turned out so well and neat..well done! Ann,Jane, I measured the amount for each layer that's why it turned out evenly. Wiffy, it is really not that difficult but extremely time consuming though. Sonia, I was like you too! The number of egg yolks had put me off for a long time. But I sucumb to the urge in the end ... haha! I like to eat layer cake, and I am still at learning stage for baking layer cake. Your cake looks very nice.